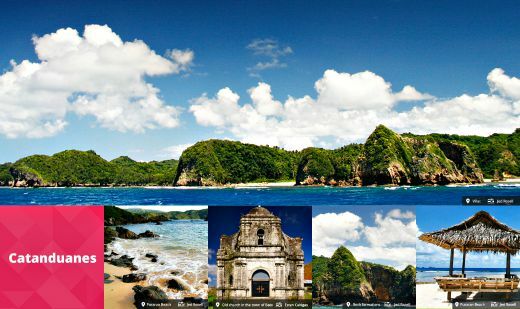 Cued by its latest recorded performance, Catanduanes’ tourism industry is expected to post another meaningful improvement this year, according to the Department of Tourism (DOT). DOT Bicol Regional Director Maria Ong-Ravanilla on Tuesday here said a recent report from the island’s Provincial Tourism Office (PTO) posted an increase of 15.18 % in the province’s tourist arrivals during the second quarter of this year compared to the same period of last year. Ravanilla said the report received from provincial tourism officer Carmel Garcia listed 53,424 arrivals within April to June this year, showing an increase of 7,044 over last year’s 46,380 in the same months. “From this second quarter increase, we can already view that the year-round tourism industry achievement of the province will be once again impressive, given that more visitors are expected in October as the province celebrates its annual Catandungan Festival and that it is again participating in the Philippine Travel Mart in September,” she said. This increase, Ravanilla said, can be attributed to the provincial government’s aggressive engagement in local tourism promotion through digital marketing strategies using online sites and news publications featuring the province’s innovative travel industry products. It could also be an influence of the foreign market trend showing that tourists, particularly foreigners, do not tend to repeat a local destination as they follow a cycle leading them from one place to another. “Tourists are now finding the island-province as an off-the-beaten path destination whose attractions are rare, natural and not yet highly commercialized,” Ravanilla said. The island, the 12th largest of the Philippines and the first landmass to be kissed by the waves of Pacific Ocean, boasts of diverse attractions from forested peaks, rugged terrains, majestic waves down to a lush underwater world, sweetly agreed by an ever- developing economy and shared by tropically warm people. Separated from the mainland of Bicol by Maqueda Bay and located at the Pacific Ocean, the province is considered one of the promising eco-tourism areas in Bicol owing to its rich ecology and majestic coastal waters that offer exciting surfing and diving sites. These waters offer thrill and adventure reeling with surf, sand and sun featuring the tourism icon of the province, the “Majestic” waves at Puraran Beach in Baras town noted as among the Philippines’ best surfing spots and sitting amid the backdrop of scintillating coves and rolling hills. The staging of various events like the 1st Enduro Challenge Motocross in the capital town of Virac, the water sports spectacular dubbed Catanduanes Reef Break in Baras and the exciting exploration through camera lenses of the province’s ecological marvels called the Viga Photocamp also helped a lot in drawing tourists and visitors to the province during the summer months, the report said. All staged last May, these events occupied the center stage of the summer month, drawing a total of over 20,500 tourist arrivals, Garcia said. Tramping, defined by the dictionary as hiking and wandering about aimlessly, was also given a more interesting meaning for adventure seekers in a summer tourism activity organized by the provincial government. For this activity, described as an engagement where participants were accorded with a once-in-a-lifetime fun and adventure of going through the ecological wonders of the island province known as the “Land of the Howling Winds”, tramping was trekking and camping en masse and in a very organized manner. It contained an almost daylong grueling hike over a steep forested course leading to the island’s highest peak—Mt. Lantad, stands approximately 1,200 feet above the sea level -- where the hundreds of participants were treated to an overnight stay, enjoying the front row seat to the mesmerizing coastal view of the province’s semi-urban sight. Lantad is a Bicol word for “exposed,” which, in this case, means a farther and wider view of Catanduanes without any obstruction. This event immensely contributed to last April’s arrivals of over 18,700 tourists. The month of June only shared a total of 14,124 arrivals this year, Garcia said. Of the total number of arrivals in this year’s second quarter, the report said 51,213 were domestic travelers while the rest were foreigners, mostly from Japan, US, Russia, Canada and Australia. “Tourism is indeed taking a crucial role in the province’s pursuit for inclusive and horizontal growth that benefits not only big investors such as hotel and resort owners and operators but also the people in the countryside where most of tourist destinations are located by providing more opportunities for employment and business ventures,” Ravanilla aid. Last year, Catanduanes achieved a rate of 15.89 percent in tourist arrival growth compared to its achievement in the previous year by receiving 151,550 foreign and domestic tourists, which showed a significant growth from its 130,766 arrivals in 2013. In an earlier statement, Gov. Araceli Wong attributed this local tourism industry gains to the unrelenting support that the national government is providing to the vigorous promotion and site development that the provincial and municipal governments of the island are initiating all-year round. The provincial government, Wong said, has been working closely with all the mayors of the 11 towns of the province in the development of the local tourism industry. Added to this is the all-out support that the Aquino administration is extending under its countryside development program geared towards the assurance that not one in the country is left behind as it advances to inclusive development, the governor said.